Three children sit in front of a shop cramped with ceramics and pottery. Inside a boy, probably an apprentice, is using a Soroban (abacus). Lots of teapots and cups can be seen. Under the eaves large plates are on display. 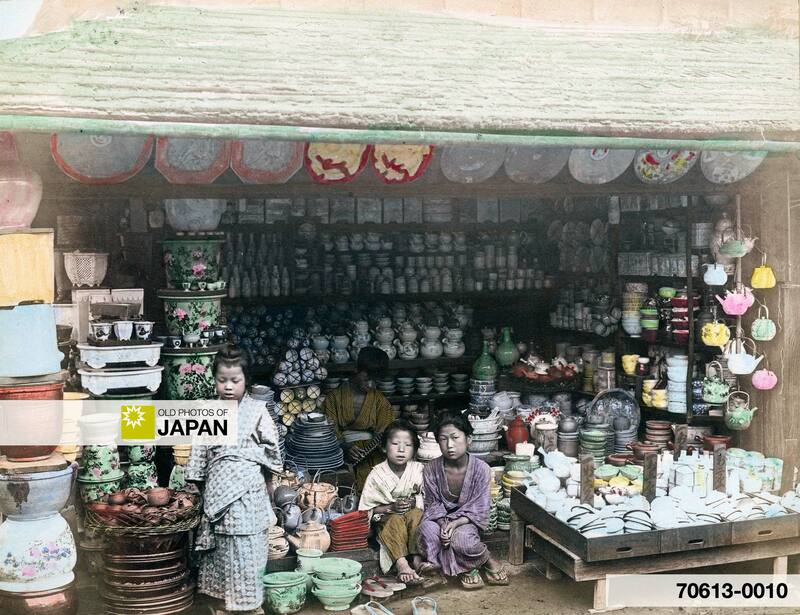 The photographs for this publication were sourced by Kozaburo Tamamura (1856-1923? ), but it is not known who the photographer is of this image. 1 Captain Brinkley, Frank (1897). Japan, Described and Illustrated by the Japanese, Shogun Edition. J B Millet Company. You can also licence this image online: 70613-0010 @ MeijiShowa.com.